I find the most challenging book reviews to write are the ones on books that are complex and ambitious. Gabrielle Calvocoressi’s third book of poems, Rocket Fantastic, is one of those books. So much is happening on so many levels in these poems that one could write about anything really. But capaciousness is a word that kept coming to mind when thinking about Calvocoressi’s book—in form, in subject matter, in voice, in spirit, and it’s one possible way to shape a stunning and intentionally shapeless book. and wet like a horse. could hear them not being afraid of me. The “not being afraid of me” repeats itself and morphs throughout the poem: “They aren’t scared of me” and “They aren’t afraid of me” appear before this last line: “I/could hear them not being afraid of me.” The speaker’s fluidity with nature continues throughout the poems such as in “I Had a Mane Once” where the speaker “let the hornets make a mockery/of me. I didn’t sweat it./I let them sting and sting.” And later in the same poem: “And yes, I was every inch an animal./But most days I was merciful....” The speaker isn’t thinking about animals or a human looking at animals, but the speaker is an animal and is simply one of the many in a larger world. entering the water but my Love tying my bow tie. We were in our little house just up from the ravine. 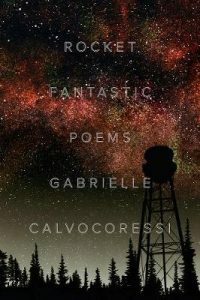 Calvocoressi can pan outward into the world and beyond, yet also write the finest lyrical love poem such as “She Ties My Bow Tie.” The poems in Rocket Fantastic expand outward and go inward and back and forth like an accordion. The intimate poems expand the expansiveness of the capacious poems and vice versa, creating an interesting tension. over with laughter. Little things. this body’s not enough for me. Victoria Chang’s fourth book of poems, Barbie Chang, was published by Copper Canyon Press in 2017. Her third, The Boss (McSweeney’s), won the PEN Center USA Literary Award and a California Book Award. Her other books are Salvinia Molesta and Circle. She also writes children’s books and Is Mommy? (Simon & Schuster), illustrated by Marla Frazee was named a New York Times Notable Book. She received a Guggenheim Fellowship in 2017. She lives in Southern California and serves as Teaching Faculty at Antioch University’s MFA Program. You can find her at www.victoriachangpoet.com.